Clos Puy Arnaud is a Bordeaux producer in the Castillon area. Clos Puy Arnaud is located in the Castillon area on the right bank of the Bordeaux region, to the east of Saint-Émilion. Castillon is part of the Côtes de Bordeaux, on the East Bank, and is situated east of Saint-Émilion. Here, Merlot dominates but Cabernet Franc (although usually in minority) often plays an important role in providing character to the wines. Clos Puy Arnaud is an organic and biodynamic producer run by Thierry Valette. I tasted these wines since they were launched by French-Swedish importer Caviste. I’ve written before about Clos Puy Arnaud wines released in 2013 and 2012 by Caviste. The wines are from the 2015 and 2016 vintages. Both are excellent Bordeaux vintages, 2015 generally more ripe and powerful, while 2016 combines good ripeness with excellent acidity and freshness. 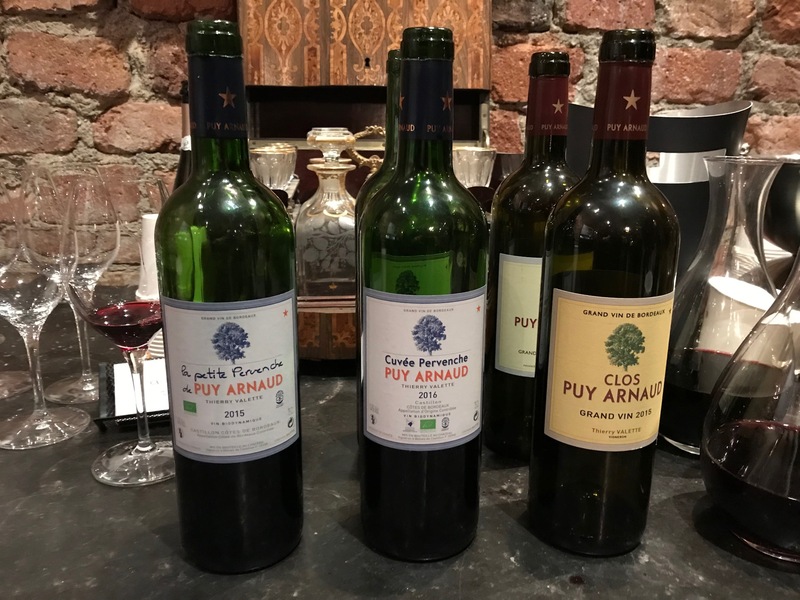 My impression of the style of Clos Puy Arnaud is that the wines show good freshness and approachability for a good Bordeaux, although the grand vin always has more tannin and needs cellaring. For Merlot-dominated wines, their alcohol level stays reasonable, which isn’t always the case these days in e.g. Saint-Émilion. Also in the ripe and hot 2015 vintage, the grand vin stays at 14%. Castillon Côtes de Bordeaux. 50% Merlot, 45% Cabernet Franc, and 5% Cabernet Sauvignon, raised in cement tanks and other neutral tanks, no oak barrels. Berry-dominated nose with ripe “semi-dark” berries including cherries, black and red currants, some spice. The palate is medium-bodied and shows good berry noes with cherries, good acidity and some tannins that bite in the finish. Reasonably approachable now for a young Bordeaux, but could probably benefit from some cellaring due to its tannins, 86(+) p.
This is a special bottling in the 2015 vintage. One of three tanks destined for Cuvée Pervenche (the regular “second wine”) showed a more approachable style and was therefore bottled separately. From the style, I also guess that it was a little lighter, and I would say that it shows good acidity for the vintage. Caviste sells it one year later than the regular Pervenche in order to have a wine more ready to drink. Castillon Côtes de Bordeaux. 75% Merlot och 25% Cabernet Franc, raised in cement tanks and used oak barrels. Fine nose with cherries and blackcurrants, slightly flowery, spice notes, hints of tar. The palate is medium bodied(+) and berry-dominated with fine berry notes of dark cherries, quite good acidity, and some tannic bite. Young, could be drunk now since the acidity provides good balance, but should preferably be cellared for a couple of years, 88(+) p.
Cuvée Pervenche is basically the “second wine” of Clos Puy Arnaud. Compared to the previous wine, which is of a different vintage, this wine shows darker berry notes, a bit more concentration, more acidity (typical for the vintage), and slightly more tannin. Castillon Côtes de Bordeaux. 60% Merlot, 35% Cabernet Franc och 5% Cabernet Sauvignon, 7 months in oak barrels of which 25% new oak. Big nose with ripe dark berries, blackcurrants, dark plums, some tar, well integrated oak, and some flowery notes. The palate is medium bodied+ and shows a berry-dominated note with good concentration of blackcurrants, mineral, and rather prominent tannins with a fine tannic structure. A long aftertaste with berries and tannins. A great wine that should be cellared, 90+/91(+) p. The best vintage of Clos Puy Arnaud I’ve tasted. The wine simply called Clos Puy Arnaud is the grand vin of the producer. Castillon Côtes de Bordeaux. 80% Merlot and 20% Cabernet Franc, raised in cement tanks and used oak barrels. Sold by Caviste in late 2013. Berry-dominated and juicy nose with red and semi-dark berries, light flowery. The palate is medium bodied with good concentration of red berries, good acidity, and some tannic bite. Approachable now but could in my opinion benefit from more cellaring, 87 p.
The berry-notes in the 2012 are more red than in the 2016, i.e., lighter. Although the wine has a fine berry note, the 2016 is at a better level, which is not surprising. In general, 2012 is a rather good Bordeaux vintage with good accessibility. It comes across as good compared to the 2011 and 2013 which were problematic on the red side, but isn’t at the same level as the top vintages 2009, 2010, 2015, and 2016. Castillon Côtes de Bordeaux. 70% Merlot och 30% Cabernet Franc, 15 months in oak barrels of which 25% new oak. Sold by Caviste in 2016. Somewhat developed but mostly berry-dominated nose with ripe dark berries, blackcurrants, dark cherries, and light flowery notes. The palate is medium bodied(+) with good berry notes of cherries and mixed currants, rather good acidity, and decently integrated tannins with some bite. Reasonably approachable wine but in my view not ready yet, 89(+) p.
The nose of the 2012 is rather similar to that of the 2015, but more berry-dominated and with slightly lighter-coloured notes. On the palate, the 2012 also shows lighter notes and les weight than the 2015, but it is still a really good wine. By the way, I also visitied Clos Puy Arnaud this summer and will try to post something about that visit as well! This entry was posted in 2015, 2016, Bordeaux, Merlot. Bookmark the permalink.